Part A. 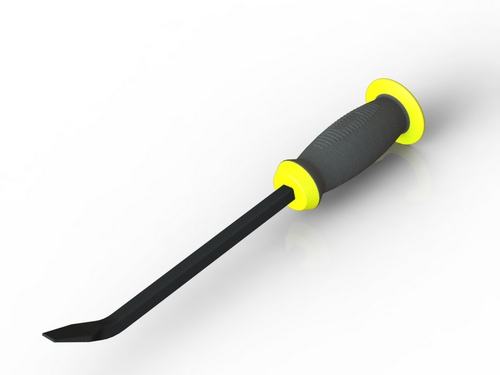 Your goal is to create a model of a Pry Bar similar to the one shown above. To make this a bit more interesting, you're going to continue using parametric modeling techniques. 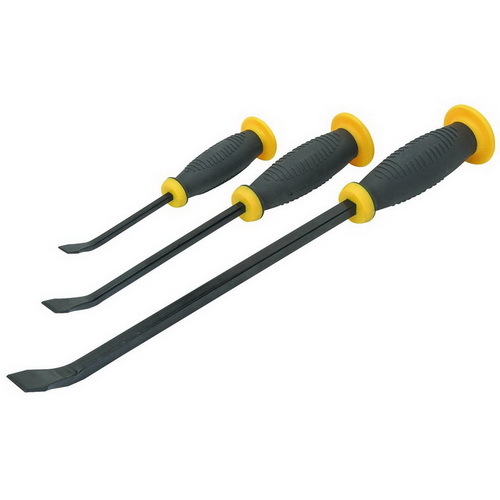 Begin by importing the base equation set found here (right-click, select download) that defines some of the basic parameters of the crowbar (Straight Length, Bar Thickness, Bend Angle, Handle Diameter, and Handle Length). Rename this file to include your PennKey ("pryBarEquations-PennKey.txt"), then add it to your model (Tools > Equations... > Import...). You can then use the parameters to help define your geometry, and add additional parameters or equations as you go. HINT: The revolve feature will be necessary for the handle, and the sweep and loft will be particularly useful for the shaft and blade. Part B: Once you've completed modeling the pry bar, spend some time using PhotoView 360 to create a realistic 1400x1050 pixel rendering as shown above. 1. Your model file, named "101-Teaser-Crowbar-PennKey.SLDPRT"
2. Your updated equation file, "pryBarEquations-PennKey.txt"
3. Your rendered output, saved as "101-Teaser-Crowbar-PennKey.jpg"
The teaser should be submitted before your lab section on Thursday.